Whoever said it is better to travel in hope than to arrive probably lived before the jet age, and is referring to a leisurely journey by train or boat. Sri Lankan Airlines is a different experience. After a half hours delay at Heathrow, you are crammed into the tube that makes up their Airbus A340 like so much toothpaste. On board you can a demonstration of true service. No matter how many times you press the call button, it is almost impossible to attract the stewardess’s attention, and once attention has been obtained, you find that the stewardess has an attention span no longer than the average goldfish, and your request, however reasonable is either ignored or transformed. The headphones for the movie don’t work, so you ask and ten minutes later, the stewardess brings you a drink. At the end of the meal, you retain your cup and ask for more coffee. Fifteen minutes later, with no response, despite pushing the call button frequently, you push your way out of the seat and go to the steward’s corner. Despite the fact you are carrying the cup, you are told no coffee, because they not have any cups. The fact I had presented one was grudgingly conceded, and I got my coffee. My travelling companions for the trip were Paul and Kevin. We arrived in Sri Lanka around 3 a.m.  inside the airport is almost indistinguishable from anywhere else in the world, whereas once you have cleared customs and immigration, it takes on a more Asian feel. At least here we were allowed to work out where we were going before we had to suffer the general crush of touts. Exchange rates in the airport are about 4% down on the town, worth knowing if you pass this way. A taxi booking desk arranged a car to town at a fixed price. Once the vehicle (it was not in any way labelled as a taxi) got started it hared off towards town. The journey is about 30km, mainly through built up areas, but we couldn’t get much bearing on the scenery as we passed. It was dark, we were travelling at full pelt, so only neon lights on the route stood out, these appeared to be mainly small eateries or hotels. 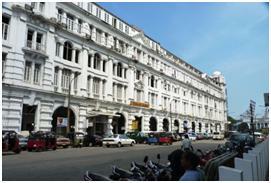 We stayed at the Grand Oriental Hotel, and they checked us in without any comment about the early hour. I hate hotels that insist check in time is 12 noon or later, especially when I arrive at 4 in the morning. The Grand Oriental must have been a key point of the old British Colonial rule, opposite the docks, one imagines the well-to-do coming off their boats from England and immediately transferring here. However, nigh on two centuries have passed since its opening, and little has been done in the way of maintenance, so the Grandeur has become somewhat faded. Inside, one finds many small faults, such as noisy and ineffective air conditioning, or a shower that tends towards an uncontrollable scalding hot. As with the national airline, the staff appear to have a limited attention span, so asking for something, (such as a fresh battery for TV remote control, or a fresh jug of water) is not guaranteed to bring results first time. 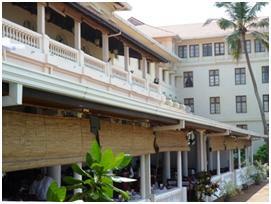 Changing from a cold winter in England to the high humidity and 30 degree temperatures in Colombo hits one quickly. One only has to step outside the hotel’s air conditioned ambience to start sweating. Colombo does not get too many tourists, and there are easily enough locals trying to persuade us to ‘take a tour’, or visit certain events. When this fails to impress, one is offered a ‘massage’, or if its late in the evening, a visit to a nightclub. Apart from on foot, the only way to travel is with the Tuk-Tuks, three wheel moped was two seats under shade at the back. The way to travel in a moped is to hang on tight  as they are always going to head off too fast for the road conditions. There are not too many sights to Colombo  the basic attraction is a contrast between old colonial buildings and the hustle of local street stalls. The guide books mark off Galle Face Green as a place to see, but all this is, is a lawn next to a wide paved promenade that overlooks the sea. On a Tuesday, the remains of the litter from last weekend’s picnics still comes to the fore, with black plastic sacks, mainly bursting with rubbish placed at unstrategic intervals along its edge. While one imagines the weekend green bustling with the local family picnickers, the area is empty on a Tuesday lunchtime, while along the promenade, the evenly positioned benches are the place for courting couples. Each contains one boy, one girl and holding one umbrella as a sun shade. I think that in the more serious relationships, the boy holds the umbrella! Wherever you wander, you cannot avoid the army checkpoints. Security is a major issue here, although the Tamils fighting for a separate state in the north have been defeated. During the war, terrorist attacks in the city were not uncommon, and the security still remains. Our hotel is right next to a restricted high security area, and we are not allowed to take pictures from the restaurant that overlooks the harbour. As this is now a major container port, it would appear to be a vital link in the nation’s trade. Even walking down the promenade at Galle Face Green, you have to pass checkpoints, and you are only allowed to take photos pointing southwards, not back towards the security zone and the presidential palace. AT the bottom end of the green, is the Galle Face Hotel, another colonial relic, but better maintained than the Grand Oriental (and hence able to price itself outside our bargain holiday price range). Still, I can take a pot of tea on their well situated veranda (it cost less than £1), and enjoy the cool air coming off the sea, and then drafted downwards by a fan above me. Here Crows chatter between the colonnades of the upper balcony, while a small squirrel runs between the tables eager to pick up scraps left by the visitors. Tuesday afternoon sees us at the Sugathadasa Stadium for the first time. This is the National Stadium and holds somewhere around 20-25,000. It is a multi-purpose stadium used primarily for Athletics, but also for Rugby and Football. Most of the ground has an even low slung roof over about ten steps of concrete. The concrete is painted but no wooden or plastic seats are provided, except in the sections closest to the main stand. With a fence and a running track before the pitch, and supporting pillars for the roof, there are no really good views to be had from the low stands. The main stand, which cover around three quarters of a side, is a two tier effort. From the lower portion, you can feel crammed in under a low roof, which is supported by view restricting pillars. Making my way upstairs, I find the rest of my party already in the best viewing positions. There is a forward section of about 10 rows, which enjoys the only uninterrupted views of the pitch. This was the only area that got crowded, even when the hosts were playing. The section is also at a good height for viewing across a track, while you are still close enough to read the players’ numbers. Above us, there are many more rows, but again the roof supports block parts of the view. 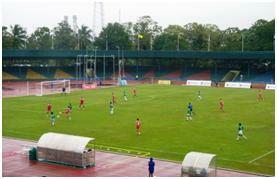 The first day’s football, a double header saw Tajikistan play Bangladesh, followed by Sri Lanka against Myanmar. We had a rainstorm just before the first match, which continued while they were playing. This made the pitch a little slippery, but did not excuse much of the play. The first half of the opening game was pitiful. There was a lack of basic skills on show as few players could either pass or trap the ball. There were a few shots and headers off target, and just one shot on target  and this had no more power than a broken down tuk-tuk. Tajikistan had come to this tournament from a country still in the grips of winter, but via a week of training in Doha, where the temperatures were not up to Sri Lankan standard (under 25° in Doha, but over 30 in Colombo, plus a much higher humidity). Their league season is on a winter break, and the team were at best rusty. With recent tournaments for the South Asian Football Federation and South Asian Games (U-23) involving many of the squad, Bangladesh came into the tournament better prepared, and this showed even in the sad show that was the first half. They were creating better chances to miss than their opponents. Although the Tajiks tried to get into the game early in the second half, the pattern soon returned, except now the chances appeared a little better. The finest piece of football of the game, halfway through the period ended with full back Nasir, overlapping down the right, cutting a ball in from the by-line to his Mohammedan Dhaka team-mate Enamul to score. Two more goals followed in quick order, although both goalkeepers may reflect that they could have done better with the chance. Rabiev levelled the scores just two minutes after his team went behind, but then Meshu got Bangladesh’s second with fifteen minutes to go. Tajik defender Choriev then got himself sent off and his team could not come close to levelling with a man short. Indeed, as they pushed forward, Bangladesh were increasingly dangerous on the break, and Enamul really should have scored again when in a one-on-one with the goalkeeper at the end. The second game saw the hosts take on Myanmar. Sri Lanka, like Bangladesh had been playing in the South Asian competitions, while Myanmar did not appear to have had much recent football. The home side came out eager to please, but with no immediate success. They could not keep this up, and were soon being pushed back into their own area. Playing in a 4-1-4-1 formation, the midfield was slow in moving up in support of the striker, but at least to start, the defence held its line. This story changed in the 18th minute when Rahmeen was adjudged to have lunged in at a Myanmar defender and received a red card. I did not have a good view of the incident, while Paul thought both players went in together and the foul could well have been given the other way. The home manager said something similar in an interview afterwards, and blamed this loss of one of his most experienced players for what happened next. What happened next was that Myanmar took control of the match, slowly at first taking the midfield with their 4-2-3-1 formation  Tun Tin Win and wide player Kyaw Thiha enjoying the freedom that the extra player gave them. Myanmar eventually took the lead on the 40th minute, with a long shot from Thiha. In the second half, Myanmar were completely dominant, but it still took until the 78th minute before they scored their second goal, Yan Oaing getting on the end of Khun Maung Tun’s cross. Pai Soe, coming on as substitute for Kyaw Thiha added another from close range in the 81st minute and Myo Min Tun added the final goal with a free kick from 25 yards, going in off the near post with two minutes to go. Matches come thick and fast in these tournaments, the group series means every team has three games to play in just five days  which really does not provide enough recovery time. Squad management is therefore of vital importance in the second and third games. The first day was hot and very humid, especially for the second game after the rain that had affected the first. The second game listed a crowd of 3000 which may well be about correct, while the 1000 recorded for the opening game appeared to be stretching the figures. On day 3, the two winners will meet in one match, the two losers in the other. I will not be viewing and it is difficult to guess the result of the ‘winners’ game. For Sri Lanka, it is equally difficult to imagine them improving much, even with a full eleven on the field. A second defeat would mean elimination for the home team, seriously affecting the rest of the attendances. This entry was posted on Wednesday, February 17th, 2010 at 09:49 am and is filed under Asian Football. You can follow any responses to this entry through the RSS 2.0 feed. Both comments and pings are currently closed.